We’d love your help. 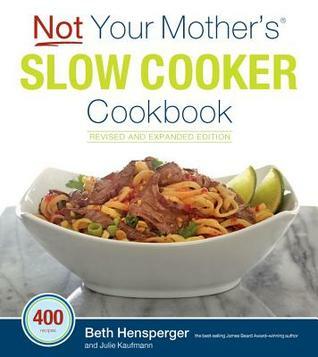 Let us know what’s wrong with this preview of Not Your Mother's Slow Cooker Cookbook, Revised and Expanded by Beth Hensperger. Beth Hensperger and Julie Kaufmann turned slow cooker recipes on th Fall in love with your slow cooker all over again. 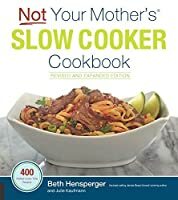 To ask other readers questions about Not Your Mother's Slow Cooker Cookbook, Revised and Expanded, please sign up. There are some nice recipes in here but it is a very basic cookbook - no pictures of any kind, no nutritional information, and it is mostly for 3 quart meals. I picked out a few I wanted to try but I was looking for much easier recipes for my son to take to college with him. This one didn't really pan out for that purpose. Beth Hensperger is a passionate professional- and home- baker who is both extremely creative and extraordinarily prolific as an author and developer of quality recipes. Her training included a ten-year apprenticeship as a restaurant and hotel pastry chef as well as having her own custom wedding cake business and attending classes given by some of the top bakers in America. Though restaurant traine Beth Hensperger is a passionate professional- and home- baker who is both extremely creative and extraordinarily prolific as an author and developer of quality recipes. Her training included a ten-year apprenticeship as a restaurant and hotel pastry chef as well as having her own custom wedding cake business and attending classes given by some of the top bakers in America. Though restaurant trained, she considers herself more of a dedicated home baker than a chef. Beth’s writing career began when she was chosen as the Guest Cooking Instructor for the March 1985 issue of Bon Appetit. She is now the author of fifteen cookbooks, many of them best sellers. Her most recent books include: Williams Sonoma Breads (Weldon Owen), Bread For Breakfast (Ten Speed Press), and The Bread Lover's Bread Machine Cookbook (HCP). The Bread Bible (Chronicle Books) is the recipient of The James Beard Foundation Award for Baking in 2000. Beth's Basic Bread Book (Chronicle Books), a sequential text for the beginning home baker, published in the Fall of 1996, was chosen as one of the best baking books of the year by People Magazine. She has been nominated twice for the IACP Julia Child Cookbook Awards. Her books are all represented at the prestigious Culinary Collection of the Schlesinger Library at Radcliffe College in Cambridge, Massachusetts.